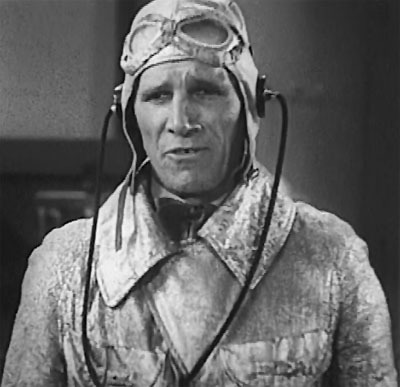 Above: Bob Kortman in the serial The Mystery Squadron (Mascot, 1933). One of the earliest and one of the best sound serial henchmen, Bob Kortman was almost never surpassed in menace by latter-day cliffhanger thugs. His gaunt build, slow and sneering voice, and gap-toothed grin made his characters seem truly terrifying; they looked (and usually acted) like living skeletons who relished inflicting harm on normal humans. Almost always a major or minor heavy in both serials and Western features, Kortman was one of the most frequent henchmen in the chapterplays of Mascot Pictures during the early 1930s, and turned in a few memorable performances in other studios’ cliffhangers in later years. Robert Kortman was born in New York City, to immigrant parents from Germany. Few details are available on his early years, but by 1915 he was living in California and working as a motion-picture actor. 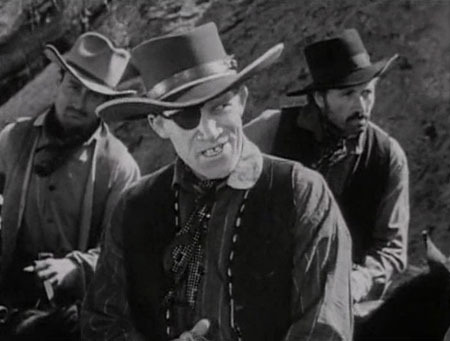 His face typed him as a screen heavy at once, and he spent most of the 1910s playing gangsters, Indians, outlaws, bullies, and other menaces in Westerns, adventure films, and dramas, including several of William S. Hart’s early shorts like The Ruse (1915) and Hell’s Hinges (1916). His career was interrupted by military service in World War 1, but the 1920s found him continuing in villain roles–playing major and minor parts in big and small films of all genres, although specializing in Westerns. Kortman’s voice matched his appearance perfectly, and his career didn’t miss a beat when the talkies arrived. One of his earliest sound films was 1930’s The Lone Defender, Mascot’s first all-talking serial. In this creaky but enjoyable Western chapterplay, Kortman was cast as Jenkins, the vicious henchman of a claim-jumping slicker named Harkey (Lee Shumway). Acting on his boss’s orders, Jenkins murdered an old prospector whose gold mine Harkey coveted; the two villains then spent the rest of the serial battling the murdered man’s heroic dog Rinty (Rin Tin Tin) and a mysterious stranger named Ramon (Walter Miller). Rinty made things particularly tough for Kortman’s Jenkins, continually attacking the man who’d killed his master; Kortman’s character responded in kind, repeatedly attempting to kill the dog despite his boss’s instructions to leave him alive in the hope that he might lead them to the mine. The part of this despicable dog-hating killer was right up Kortman’s ally; the sneering vindictiveness he displayed when threatening Rin Tin Tin made him seem memorably hateful. 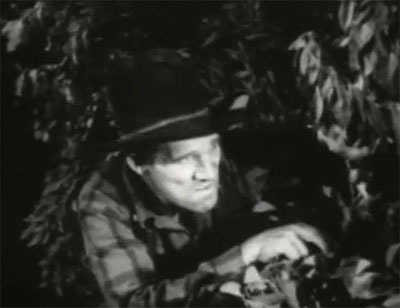 Above: Bob Kortman spies on a prospector in the first chapter of The Lone Defender (Mascot, 1930). The next five years found Kortman working chiefly in B-westerns for Columbia, Monogram, and various independent studios (menacing stars like Ken Maynard and Buck Jones), and in additional Mascot serials. His second Mascot chapterplay was 1931’s Harry Carey vehicle The Vanishing Legion, which featured Kortman as the henchman (one Marno) of a mysterious outlaw called the Voice. Legion had a large cast of good guys, villains, and quasi-villainous “suspects,” and Kortman—though the villains’ chief field commander—had rather less screen time than in Lone Defender; however, he was too memorably creepy to get lost in the shuffle. His vindictive glee every time the Voice ordered him to get rid of Cardigan (Carey) was particularly memorable; he acted as if he had a personal grudge against the hero even before he tangled with him for the first time. Above: Bob Kortman battles Harry Carey in The Vanishing Legion (Mascot, 1931). Above: Harry Carey and Bob Kortman try to surprise each other in another still from The Vanishing Legion. Kortman’s third serial was Mascot’s The Lightning Warrior (1931). 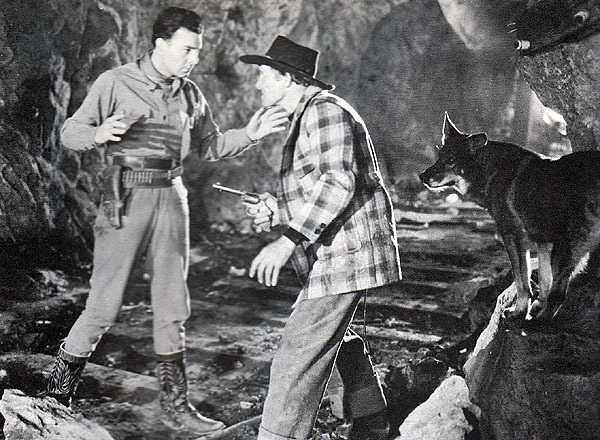 As Wells, one of two chief henchmen to a mystery villain called the Wolf Man, Kortman repeatedly tangled with heroes George Brent, Frankie Darro, and Rin Tin Tin, but (as in Vanishing Legion) was somewhat cast into the background by the serial’s considerable assembly of sinister Wolf Man suspects. Kortman’s role in Lightning Warrior did (atypically) allow him to pose as a supposedly honest citizen in many scenes; despite a grudgingly friendly façade, he did not fool Rin Tin Tin or the audience. Above: Bob Kortman has the drop on George Brent in The Lightning Warrior (Mascot, 1931) but is unaware that Rin Tin Tin is behind him. The Last of the Mohicans (Mascot, 1932) gave Kortman his biggest and best serial role. Loosely based on James Fenimore Cooper’s novel and starring Harry Carey as Hawkeye, the cliffhanger co-starred Kortman as Magua, a vicious Huron Indian bent on vengeance on the daughters of a British colonial officer who had once ordered him flogged. Kortman got to serve as the principal villain in Mohicans, and used his extensive screen time to make the cunning, vindictive Magua one of the scariest heavies in any serial; his performance conveyed a savage rage barely repressed by a rather sneering stoicism. 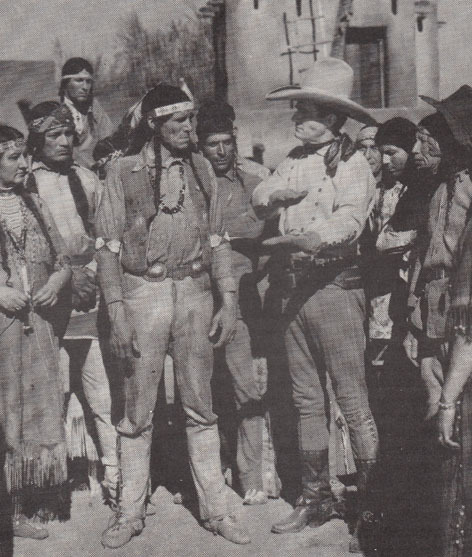 Above: Bob Kortman tries to convince the Mohicans to join the Hurons on the warpath in The Last of the Mohicans (Mascot, 1932), to the disapproval of Hobart Bosworth as the Sagamore. Above: Bob Kortman threatens Lucile Browne in Last of the Mohicans. The Whispering Shadow (Mascot, 1933) cast Kortman as Jasper Slade, a tough and shrewd lone-wolf jewel thief who escaped from prison in an attempt to keep a rival gang (led by the serial’s titular villain) from stealing the priceless crown jewels he had purloined and hidden before being sent up. Yet another colorful Mascot cliffhanger overcrowded with villains and suspects, Shadow gave Kortman a juicier role than either Vanishing Legion or Lightning Warrior had; he spent the chapterplay popping in and out of scenes sinisterly and unexpectedly–sneering at the threat of the dreaded “Whispering Shadow,” attempting to subvert the Shadow’s henchmen, and violently attacking anyone who wouldn’t get out of his way, until finally getting electrocuted while threatening heroine Viva Tattersall in Chapter Eleven. 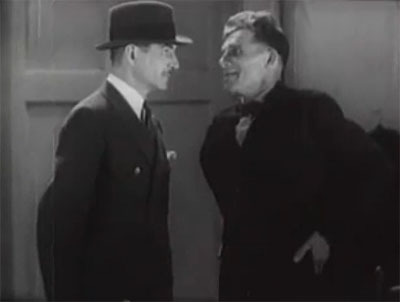 Above: Bob Kortman strikes a deal with Lloyd Whitlock in The Whispering Shadow (Mascot, 1933). Later in 1933, Kortman appeared in yet another Mascot serial, The Mystery Squadron. This exciting aviation adventure starred Bob Steele and Guinn “Big Boy” Williams as two pilots out to run down a criminal called the Black Ace and his gang of aerial henchmen; Kortman, as Bracken, was the leader of said henchmen. His role here allowed him plenty of opportunities to bestow intimidating glares or gloating leers on the good guys, as well as growl orders at the airborne thugs under his command. 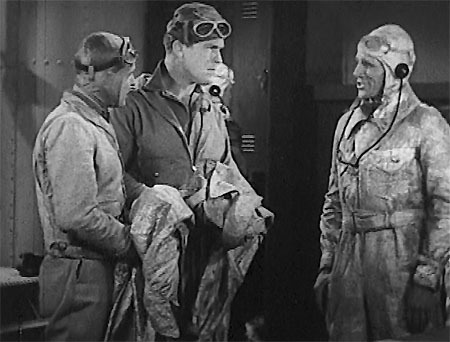 Above: Bob Kortman orders his prisoners Bob Steele (far left) and Guinn “Big Boy” Williams to dress in the uniforms of The Mystery Squadron (Mascot, 1933). The racing-themed thriller Burn-‘Em-Up-Barnes (Mascot, 1934) was one of Mascot’s best cliffhangers, but it gave Kortman his least interesting Mascot role; he was merely a background member of the henchman pack (Frazer by name) and received almost no dialogue–although he participated in a lot of the serial’s wild action, chasing heroes Jack Mulhall and Frankie Darro up and down highways and through crowded garages. 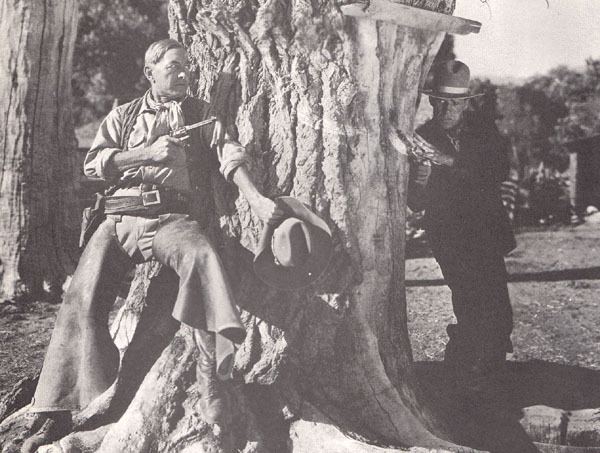 However, in Mystery Mountain (also Mascot, 1934), Kortman (as an outlaw named Hank) was back to the action heavy role, commanding the followers of the mysterious Rattler and repeatedly trying to gun down hero Ken Maynard. 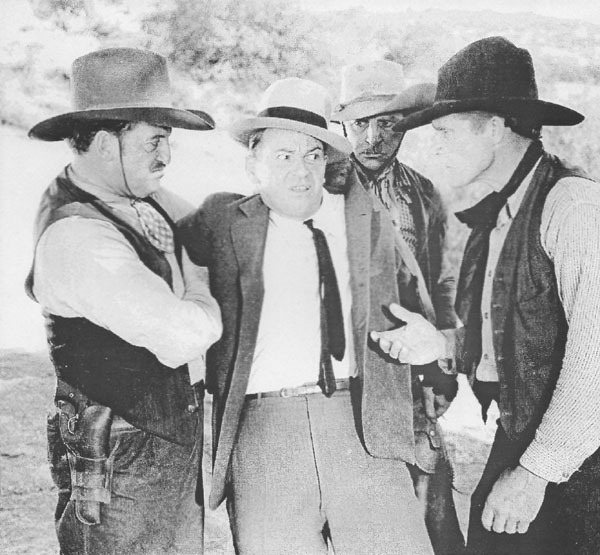 Above: Bob Kortman tries to intimidate Syd Saylor in Mystery Mountain (Mascot, 1934); holding Saylor are Lew Meehan (far left) and Frank Ellis. Kortman’s last Mascot serial was The Miracle Rider, a 1935 chapterplay starring Tom Mix as a modern-day Texas Ranger protecting the Ravenhead Indians from land-grabbers led by Charles Middleton. Kortman played a more complex villainous role than usual; as a half-breed Ravenhead named Longboat, he was secretly helping the villains against his tribe, out of a burning desire to be chief. Longboat performed many treacherous deeds, but stopped short of actually murdering one of his fellow-tribesmen when he had the chance–a glimmer of decency which foreshadowed his eventual death-bed repentance after being betrayed by his associates. Kortman pulled off his unusual part well, giving Longboat much of the same angry cunning he had given Magua in the earlier Last of the Mohicans but managing to extract a bit of pathos from the character’s final scene. 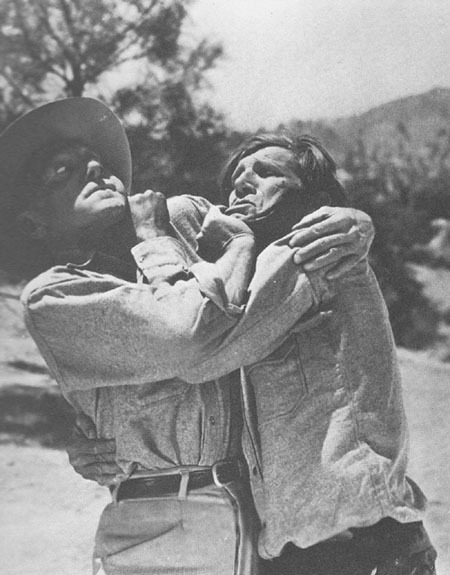 Above: Bob Kortman confronts Tom Mix in The Miracle Rider (Mascot, 1935). Kortman continued to plague B-western heroes ranging from Hoot Gibson to John Wayne for the rest of the 1930s, in features from all the principal sagebrush studios. 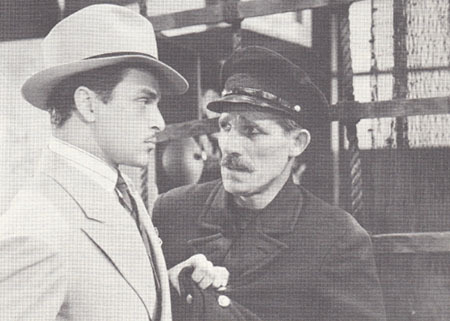 He also took a few bits in bigger movies during this time, and appeared in several more chapterplays as well–including The Clutching Hand (Stage and Screen Productions, 1936) which featured him as Spike Harvey, aka “Number 6,” one of the operatives of the title mystery villain. Hand was an incredibly complicated serial that made Kortman’s more convoluted Mascot outings look simple by comparison; the serial’s enormous cast of characters left him with comparatively little to do other than participate in occasional attacks on hero Jack Mulhall and other characters. He finally got an individualized scene in Chapter Ten, sneeringly exposing a fake medium and forcing the fraud to join him in an independent robbery scheme; however, he was seized by his fellow thugs and rubbed out (off-camera) in the same episode, as punishment for his moonlighting (in a typical example of the serial’s slipshod production values, he was subsequently shown briefly as listening–via a television device–to the Clutching Hand’s grim announcement of his character’s removal). 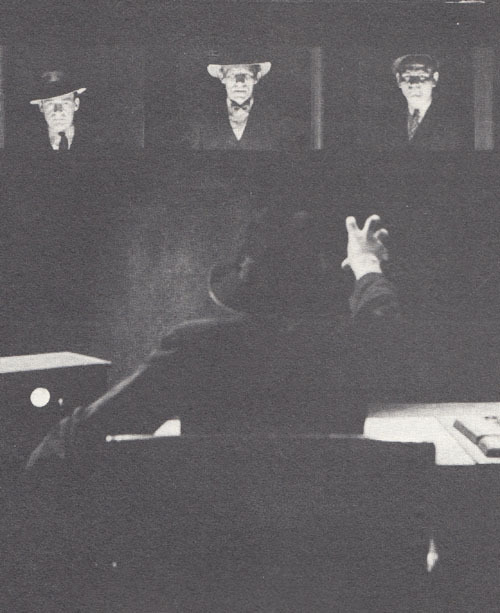 Above: The Clutching Hand (Stage and Screen, 1936) gives orders to his men via a futuristic television setup. 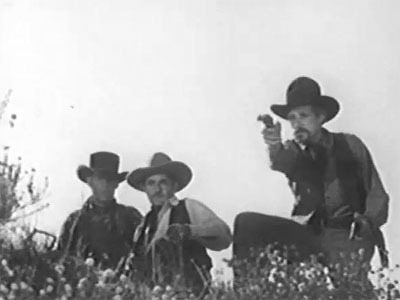 Earle Douglas is on the left-hand screen, Bob Kortman on the center screen, and Yakima Canutt on the right-hand screen. 1936’s The Vigilantes Are Coming was the first Western serial released by the newborn Republic Pictures, formed from a merger of Mascot and other studios. Mascot’s boss Nat Levine was still in charge of serial production at the new outfit, so it was natural that he would call on his old standby Kortman for a major henchman role in Vigilantes. This chapterplay pitted outlaws, Russian agents, and a renegade US General against California settlers led by the masked Eagle (Bob Livingston); Kortman appeared as Petroff, leader of a Cossack squad assigned to the treacherous General’s command by his Russian allies. Though he looked as nasty as ever and did his best to kill the hero with sword and gun, Kortman played Petroff as a little more dignified and less delightedly sadistic than his earlier heavies; the Cossack seemed to behave brutally as a military necessity, not for the sake of enjoyment. 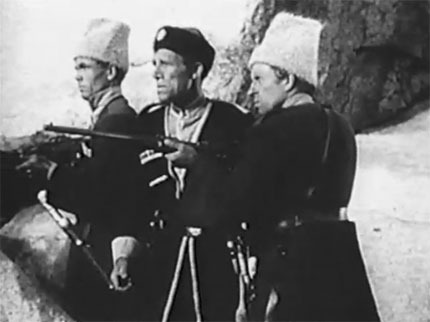 Above: Bob Kortman and two of his Cossacks wait to ambush the Eagle in The Vigilantes Are Coming (Republic, 1936). Kortman was a more characteristically enthusiastic scoundrel in Robinson Crusoe of Clipper Island, Republic’s fourth serial (also 1936). As Captain Wilson, he commanded a small ship carrying Secret Service agent (Ray Mala) to the titular island–while, as a member of a spy ring using the island as its headquarters, he tried to prevent Mala reaching his destination. 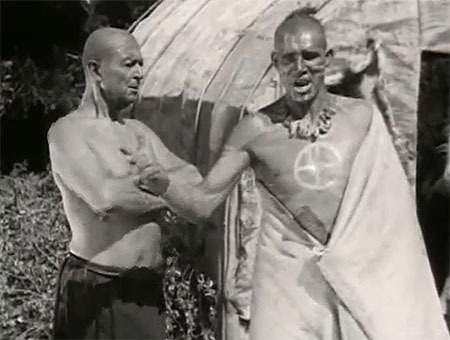 Kortman was prominent in this serial’s first chapter, plotting against Mala with island witch doctor John Picorri and even instigating (with sneering relish) an attack on Mala’s faithful dog; however, once Wilson and his crew arrived at the spy ring’s main headquarters in Chapter Two, Kortman was relegated to the background for the remainder of the serial, serving as a mere henchman pack-member and rarely receiving dialogue. 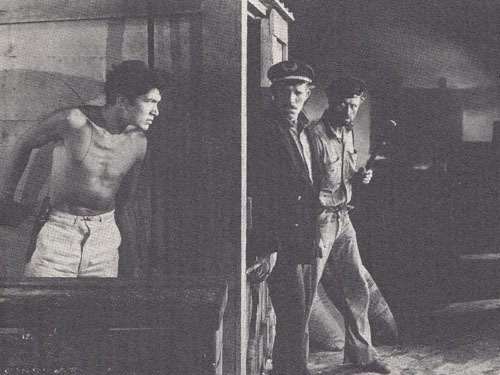 Above: Ray Mala sneaks up on the waiting Bob Kortman and Al Taylor in Robinson Crusoe of Clipper Island (Republic, 1936). Secret Agent X-9 (1937), Kortman’s first Universal serial, gave him the first inactive heavy role of his cliffhanger career, a change that Kortman—by now pushing fifty—probably appreciated. As “Trader” Delaney, a cagy waterfront dealer in stolen goods, Kortman’s character worked with various crooks in the second half of the serial, eventually double-crossing master jewel thief Henry Brandon and getting gunned down in the final chapter. Above: Henry Brandon and Bob Kortman in Secret Agent X-9 (Universal, 1937). 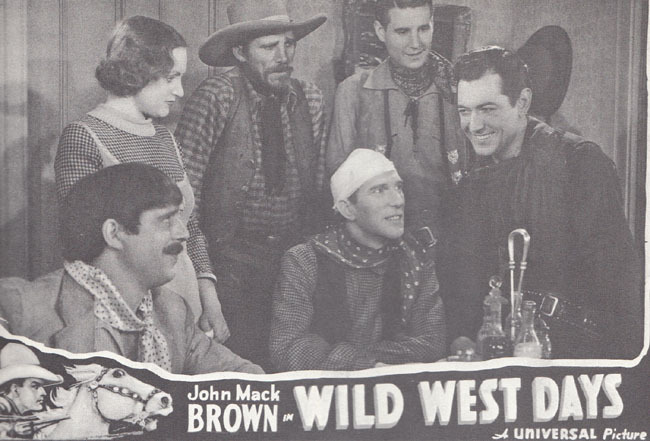 Wild West Days (Universal, 1937), awarded Kortman a truly offbeat part, the best one of his serial career after his turn as Magua: he was cast as a full-fledged good guy, the sharp-shooting, quick-drawing Trigger Benson. As sidekick to hero Johnny Mack Brown, Kortman shot it out with the villains in chapter after chapter, saved the hero’s life in the finale, and even found time to trade humorous dialogue with fellow sidekicks Frank Yaconelli and George Shelley. With a goatee somewhat concealing his sinister face, and a wry grin in place of his usual nasty sneer, Kortman managed to succeed admirably at playing against type, making his character completely likable while still giving him a dangerous edge befitting an expert gunfighter. 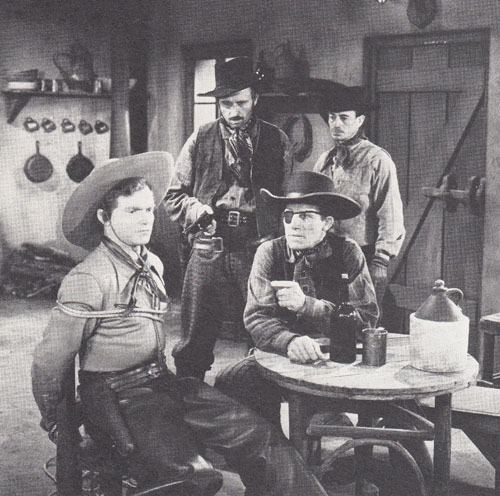 Above, standing from left to right: Lynn Gilbert, Bob Kortman, George Shelley, and John Mack Brown in Wild West Days (Universal, 1937). Seated are Frank Yaconelli and Frank McGlynn Jr.
Kortman was back at Republic Pictures later in 1937, once more playing a henchman. Zorro Rides Again featured him as Trellinger, the right-hand man of outlaw leader Richard Alexander. Alexander had the lion’s share of the villainy in this serial, but Kortman took part in most of his acts of terrorism (directed against the California-Yucatan railroad) throughout, singling himself out for the audience’s hatred in Chapter One when he viciously gunned down a small Mexican boy and his wagon-driver father. Above: Bob Kortman fires off a (deadly) parting shot at the off-screen Nigel De Brulier in Zorro Rides Again (Republic, 1937). With one notable exception, Kortman would play no more large roles in serials. He played a one-chapter bit as a crooked mechanic in The Spider’s Web (Columbia, 1938), appeared in The Lone Ranger (Republic, 1938) as a crooked Texas State Policeman who had an old man and his grandson shot in the back (all of his footage, however, was lifted from an earlier Republic B-western), played a crooked bartender throughout The Oregon Trail (Universal, 1939), and popped up very briefly as a ballot-box-stuffing gangster named Scanlon in one chapter of The Green Hornet (also Universal, 1939). In 1940, Kortman made a last return to prominent serial infamy in Republic’s Adventures of Red Ryder. As an outlaw named One-Eye Chapin, Kortman handled all the active villainy for Noah Beery Sr. and Harry Worth, who were bent on seizing valuable ranchland to sell to an incoming railroad. Kortman was fully as menacing here as in his 1930s heyday, grimly taunting or happily mowing down numerous victims. He also delivered a memorable death scene, veering from terror to desperation to grim resignation when forced into a one-on-one gun duel by hero Don Barry in the penultimate chapter. Above: Bob Kortman and his men prepare for a raid in Adventures of Red Ryder (Republic, 1940). Al Taylor is on the right. Above: The eye-patched Bob Kortman taunts Don Barry in Adventures of Red Ryder (Republic, 1940). That’s Al Taylor again standing between Barry and Kortman. Red Ryder effectively served as Kortman’s farewell to the serial genre, but he appeared briefly in two more cliffhangers—both Universal outings–later in 1940, taking a one-chapter bit as an outlaw named Gorbel in Winners of the West and another one-chapter bit as an unnamed gangster in The Green Hornet Strikes Again. Kortman kept working as a B-western henchman for the first seven years of the new decade, appearing opposite Don Barry, William Boyd, Russell Hayden, Tex Ritter, and other cowboy heroes. The aging badman’s 1940s roles tended to be smaller or less active than in earlier years, but he still took on some leading action heavy parts from time to time; his last B-western was the 1947 Charles Starrett film Landrush, released by Columbia. Afterwards, he seemed to find a niche in Paramount’s A-films during the late 1940s and early 1950s, playing small character roles—usually villainous and uncredited—in both Westerns and non-Westerns, and even winning one final credited part (as a good guy, yet) in Paramount’s 1950 Ray Milland A-Western Copper Canyon. Kortman’s last screen role, however, was a villainous one, a henchman who was gunned down by Sterling Hayden early on in the 1952 Paramount A-Western Flaming Feather. He retired later in 1952, and passed away fifteen years later in Long Beach, California. Bob Kortman might not have been the biggest or the slickest of serial henchmen, but he was easily the most frightening. The leading villains he served in so many of his Mascot serials needed masks or cloaks to augment their villainy, but Kortman’s unmasked face had more ghoulish menace in it than any of his bosses’ getups; to this day, serial fans remember him vividly as one of the earliest and greatest bogeymen of the genre. Above: Kortman as Magua in The Last of the Mohicans. Acknowledgements: My thanks to the Old Corral’s page on Bob Kortman for biographical information (particularly for Kortman’s correct birthplace and the info about his military service).